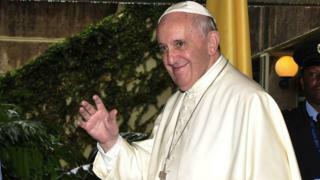 Image caption Did papal pressure convince a president to play nicely? As world leaders hail what they are calling an historic deal at the climate summit, rumours abound about how the final deadlock was resolved. Exhausted delegates were held up for hours in the final stage of the conference as final glitches were ironed out. It was a typical last-minute drama in climate talks. The world is gathered to cheer a deal, then a few nations decide to dig in their heels. This time, the US is one of the deadline delayers; it often is. The text says developed countries "shall" take the lead in cutting emissions. US lawyers say this will never get through Congress. "Shall" implies legally binding; the verb should be "should". It's apparently an oversight, or a translation error. Whatever it is, it creates a moment of opportunity for other big players to find more "errors" to benefit them. US Secretary of State John Kerry is in the thick of it. He's calling someone on his mobile phone, then handing the phone to other delegates - with the White House presumably at the other end. Just as "shall" is eventually being softened to "should" in a text revision, other obstacles are being raised in the chase towards the finish line. First it is Turkey. The UN is asking it to do too much, Turkey complains. The French conference chairman Lauren Fabius promises to hear its plea later. Then Nicaragua will not sign up. It says there is a total mismatch between what the document says is needed to protect the climate, and what it proposes to do about it. This is true and others nations feel the same. But they are not willing to ruin the deal to make the point. How was this hurdle overcome? Well, it is rumoured that the Pope had to phone the president of Nicaragua to make a personal plea. An even more outlandish rumour suggests UN Secretary-General Ban Ki-moon had to promise to visit Nicaragua on 26 December to celebrate Christmas. Whatever the truth of these rumours, this extraordinary deal was eventually done. We will have to keep an eye on Mr Ban to see where he will be eating his turkey. COP 21 - the 21st session of the Conference of the Parties - saw more than 190 nations gather in Paris to agree a new global deal on climate change, aimed at reducing greenhouse gas emissions to avoid the threat of dangerous warming due to human activities.